I'm going to explain it now. All these factors have created a European spirit. Languages are indeed extremely different, they are coming from more than four different roots and are factors of divisions inside Europe. Even the borders of Europe are discussed. Some think Europe should include Russian, some Turkey and some prefer to stop to the borders of community. All European countries are under democratie and it's a very important topic for European people. We have very close standards of life. We share the same way of life (music, movies, culture...).Encouraged by program like Erasmus who has the aim to develop the European Identity. What will be the European paradise? You are welcome by an English. A French will shake the meal. An Italian will make the ambiance. And a German manage the other all. But what will be hell? You are welcome by a French. An English man make the food. 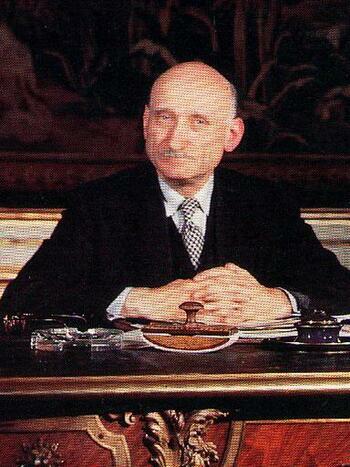 Robert Schuman was born in 1886 in Luxembourg.He was considère to be one of the founding fathers of european building. He lived in Alsace Lorraine .His father was a french citizen and his mother was an Allemand citizen. He was educated at the Athénée. After graduation he became lawyer and he decided to install his office in Metz in 1912. In 1919 he became a french citizen and he was elected as deputy to parliement. In 1939 the second War World arrived and he was named under secretary of State for refugies. On July 10th, 1940, with 568 other parliamentarians it votes for « full powers » in the field marshal Pétain. Back in Lorraine, it was stopped by Gestapo and put in secret in the prison of Metz, then transferred to Neustadt in Love-Palatinate on April 13th, 1941. It gets away and succeeds in joining the free zone in August, 1942 by way of the abbey of Ligugédans the Vienne. From 1958 at 1960, he was the 1st President of the European Parliament who awards him, at the end of it’s mandate, the title of "Father of Europe". He lived policy in 1962 and died in 77 years on September 4th, 1963 to him in Scy-Chazelles near Metz, in Lorraine. Signed in Paris on April 18th, 1951, this treaty etablished The European Coal and Steel Community(E.C.S.C) had the modest aim of centralised control of the previously national coal and steel industries of its member states, was declared to be "a first step in the federation of Europe". The founding members of the Community were Belgium, France, Italy, Luxembourg, the Netherlands and West Germany. 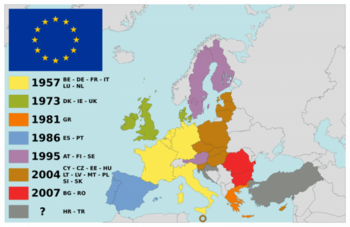 Two additional communities were created in 1957: the European Economic Community (EEC) establishing a customs union and the European Atomic Energy Community (Euratom) for cooperation in developing nuclear energy. The Merger Treaty (also called Brussels Treaty) was Signed in Brussels on 8 April 1965. This Treaty combined rhe executive bodies of the European Coal and Steel Community (ECSC), European Atomic Energy Community( Euratom) and the European Economic Community (EEC) into a single institutional structure. This Treaty is regarded by some as the real begining of the modern European Union. The goal of this treaty was to remove remaining barriers between countries, increase harmonization, increasing the competitiveness of European countries. It reformed the operating procedures of the institutions (which then had 12 members, rather than 6 as initially) and Qualified Majority Voting was extended to new areas. An aim was set of a single market by 1992. The act introduced European Political Cooperation, forerunner of the European Union's Common Foreign and Security Policy. The act was signed at Luxembourg on February 17, 1986, and at The Hague on February 28, 1986. The Treaty of Amsterdam amending the Treaty of the European Union, the Treaties establishing the European Communities and certain related acts, commonly known as the Amsterdam Treaty, was signed on October 2, 1997, it made substantial changes to the Treaty on European Union.The Amsterdam Treaty meant a greater emphasis on citizenship and the rights of individuals, more democracy in the shape of increased powers for the European Parliament, a new title on employment, a Community area of freedom, security and justice, the beginnings of a common foreign and security policy (CFSP) and the reform of the institutions in the run-up to enlargement. The Nice Treaty was signed by European leaders on 26 February 2001 and came into force on 1 February 2003. It amended the Treaty on European Union and the Treaty of Rome. The Treaty of Nice reformed the institutional structure of the European Union to withstand eastward expansion, a task which was originally intended to have been done by the Amsterdam Treaty, but failed to be addressed at the time. 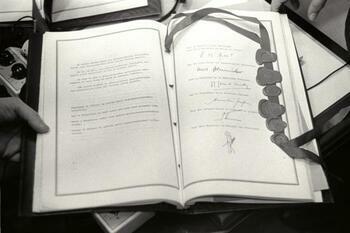 All this Treaties entered into force one year later their signatures . All the extensions were made made by a treaty which must be signed by all the states in the EU, Norway have been refused twice in 1972 and 1994.